Pancreatic cancer acupuncture therapy is an interesting mix of modern science and ancient healing. Acupuncture is a very old medical art. The Chinese have used this ancient form of natural healing for over 2,000 years to relieve many ailments. Western medicine is just beginning to explore its potential uses, and as with any “new” therapy, it has its share of skeptics. Mom was skeptical but curious about the use of acupuncture therapy. For the pancreatic cancer patient, we heard that acupuncture could be useful in relieving the cancer pain, as well as lessening the degree of nausea and fatigue brought on by the chemo and radiation. 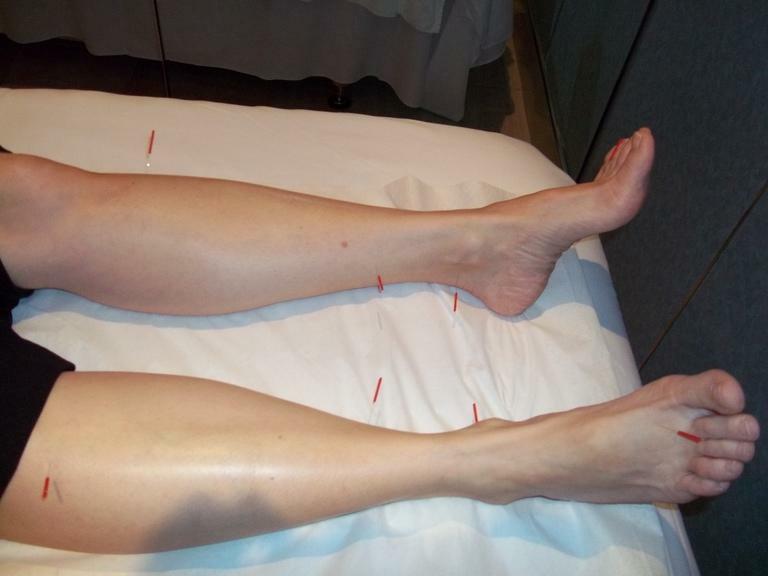 This type of cancer acupuncture is commonly referred to as medical acupuncture. We talked about it occasionally, and she thought it would be something to consider if her pain got out of control. With her medical background as a nurse, she was a definite believer in narcotic pain relief. Trusting in acupuncture was a stretch. And as it turned out, the MS Contin, morphine, seemed to keep the pain in check and she never did try the cancer acupuncture therapy. I, however, have been extremely curious and really wanted to find out just exactly what acupuncture was all about. On a recent cruise with Dad, I was handed the opportunity on a silver plate. The cruise ship spa had an acupuncturist on board and she offered a gentle, introduction to acupuncture. And got her to take pictures. All for the sake of research! But seriously, I was curious and until I actually went under the “needle” I had no idea what to expect. The pictures might give you a better idea of the actual procedure. Believe me, if I could do it, anyone can! However, before I post the pics, let me share a little about the science behind cancer acupuncture therapy or medical acupuncture. Acupuncture is performed by inserting tiny needles into specific points on your body. This stimulates the nervous system (laughing, ok, I was really nervous, but we’re talking about the body’s internal nervous system!). By gently moving or “needling” these acupuncture points, the nervous system supposedly releases chemicals and/or hormones into the body to help promote natural healing and improve functioning of the body. If you read any of the ads for traditional acupuncture you may see phrases like “vital energy” or “energetic imbalances” and “meridian channels in the body” or “disturbance of the flow of qi in the body”. The use of these lyrical descriptions might scare off some, but the science of these imbalances is fairly accepted. Cancer is definitely an imbalance of normal cells…Perhaps cancer acupuncture therapy is on to something. I arrived for my treatment at 9:00 sharp. Lian met me with a sweet smile and ushered me back to a quiet room with a treatment table. Lighting was subdued and there was soft music playing. Obviously, meant to be soothing. She had me sit on the table first and explained the treatment process. Lian showed me the needles used. They are about 2 inches long, very, very slender, and came in individual sterilized packages. Each needle had a red tip, you can see them in the pictures. The needles are also very flexible, not rigid like I expected. She said I may feel a slight pinch or pressure when she inserted them, but it would not hurt. Then she would move the needle slightly to “needle” the acupuncture point. After all needles were inserted (she used approximately 10 needles, although a treatment could consist of as little as 3 to as many as 15 needles), she would dim the light further, leave the room, and allow me to relax for 20-30 minutes. She said I may even fall asleep (which I did). After this relaxation time was up, she would remove the needles and send me on my way. She asked if I was ready. You bet! I have to be honest. It did not hurt at all when she inserted the needles, but I did feel it. Sort of like a tiny little scrape or slight pressure at the point of insertion. And I did feel it when she “needled” the point, but again, not painful, just a little something there. She had told me I may feel a cold sensation pass through my body, or even a hot flash, at first. This generally passes quickly and leads into the relaxation phase. Again, to be honest, I really didn’t think I would feel anything, but right after she left the room, I did feel a chill pass through my body. All in my mind, perhaps her prior suggestion? I don’t know, but I sure felt it. And then came the relaxation. My body turned into a noodle, so very relaxed. Oh, and one point to mention here, right after she had finished inserting the needles, she covered me with a blanket. I tensed immediately thinking the blanket would somehow push the needles in further, but she just smiled and reminded me how flexible the needles were and that they would bend under the blanket. Which they did. I guess. I never felt them move! And so I slept. And she woke me up. And I couldn’t believe I actually slept through my first acupuncture treatment! Lian told me to be sure I drank plenty of water the rest of the day to keep my body hydrated. She also told me that acupuncture will generally lead to several nights of very good rest. And that was true also. Of course, I was on vacation. On a cruise ship. Getting a good nights rest was a piece of cake! But maybe, just maybe, Lian’s treatment really helped. Medical acupuncture is being used to treat a wide range of medical problems, not just for cancer acupuncture therapy. In addition to pain control and nausea relief, acupuncture is also used for digestive disorders, asthma, headaches, sciatica, menopausal symptoms like hot flashes, tendinitis and even insomnia to name a few. If you are having difficulty controlling your pain level, or perhaps are suffering through nausea and fatigue from chemo treatments, cancer acupuncture therapy may be of interest to you. I wish mom would have had the chance to try this line of treatment to see if it really did help her pain level. Reducing the amount of pain narcotics she was taking would have been a good thing. My research in this area is very simple to be sure. I tried the acupuncture mainly out of curiousity, but not having cancer limits my ability to determine its true effectiveness in the cancer arena. Traditional acupuncture has survived the test of time in the Eastern culture. I feel that Western medicine is finally taking a good, long look at its benefits. It may indeed be an aid in the treatment of pancreatic cancer side effects. I would love to hear from you if you've tried acupuncture in your pancreatic cancer journey. Drop me a note on our Contact Us page! One word of caution here. If you are interested in trying cancer acupuncture therapy, be sure to find a licensed acupuncturist. You want a professional who is trained in the medical art of acupuncture. One good place to start your search is through the American Academy of Medical Acupuncture. Cancer Acupuncture Therapy is a part of the holistic medical movement, but I feel that it has some definite potential in this journey with pancreatic cancer. Some think it’s part of the mumbo-jumbo, hocus-pocus new age movement, but I find it interesting to note that veterinarians have begun using acupuncture to treat many of their animal patients. Obviously you don’t have to “believe” in the acupuncture for it to work. Cats, dogs, horses and the like don’t need to understand it or believe in it for the acupuncture to be effective. An intriguing thought. Whatever your take on acupuncture, I found it to be a completely relaxing experience, despite the fact that a stranger was tapping 2 inch long needles into my feet, legs, hands and head!